LAST PHOTO OF WALKER MINUTES BEFORE CRASH: Paul was photographed getting into the Porsche GT that he and friend Roger Rodas would lose their lives in. 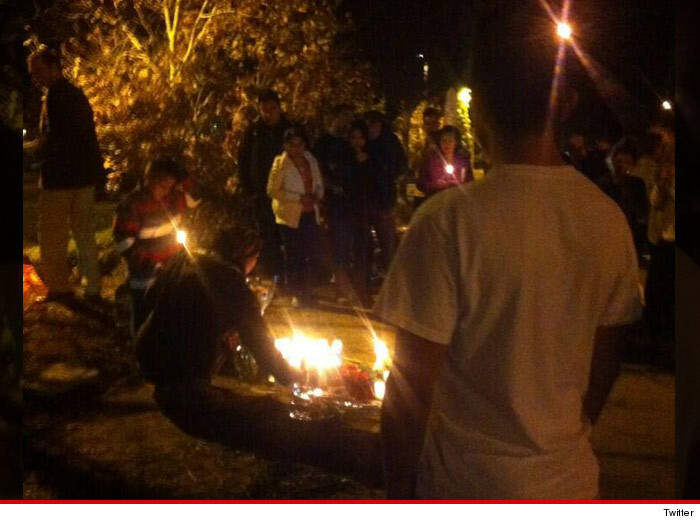 UPDATE: Fans soon started to gather at the crash site last night, leaving flowers and candles for the deceased. The vigil was held very shortly after law enforcement cleared the scene — removing the bodies of Paul and the driver Roger Rodas … as well as the charred wreckage. Beloved actor Paul Walker’s daughter, Meadow Walker, was with her father at his charity event, right before he died on Saturday, Nov. 30. 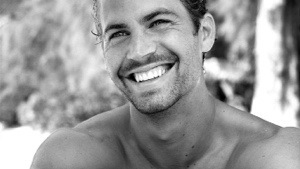 The Fast & Furious star was 40, when the sports car he was riding in burst into flames. 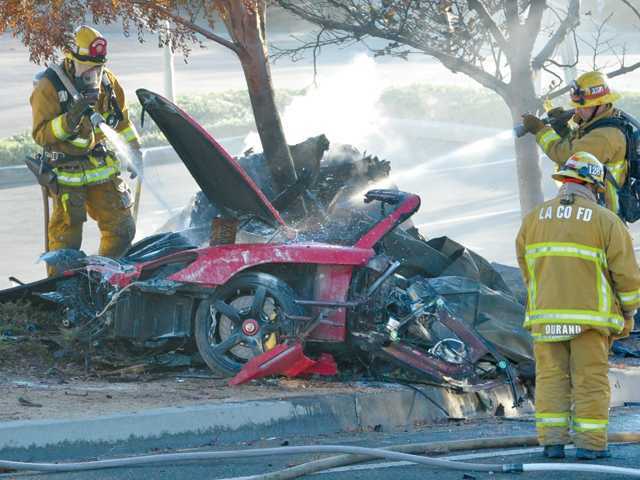 Walker was in the passenger seat of a 2005 Porsche Carrera GT, driven by a racing team partner, friend and financial advisor Roger Rodas, that slammed into a light pole and burst into flames in an office park in the community of Valencia in Santa Clarita, about 30 miles north of Hollywood. Cops say speed clearly played a major factor in the accident, but an exact cause has not been determined yet. Figure 8 patterns were also spotted close to the wreckage. The crash occurred on Hercules Street in the Rye Canyon Industrial Park. Several of Paul’s friends were attending the event … which was very near to where the deadly accident happened. A witness to the crash said the car was in half, but initially, they couldn’t tell if anyone was in the vehicle. Soon after, however, they could tell that the passengers were still inside. 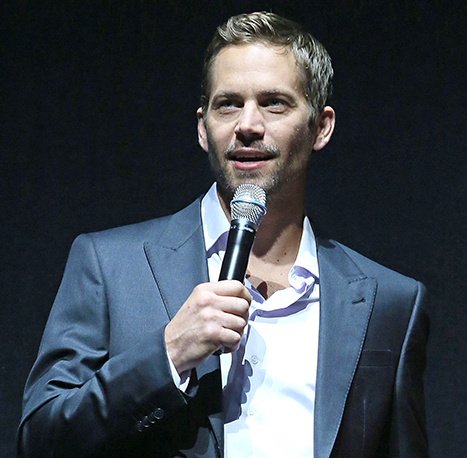 UPDATE: Paul Walker left behind a 15 year old daughter Meadow Walker. Outdoorsman, ocean addict, adrenaline junkie… and I do some acting on the side. That’s what actor now angel Paul Walker had posted on the banner of his Twitter profile. It looks like the actor lost his life doing what he loved…racing. It truly saddens my heart to report that actor Paul Walker lost his life earlier today (around 3:30 pm) in a car crash. He was 40 years old. 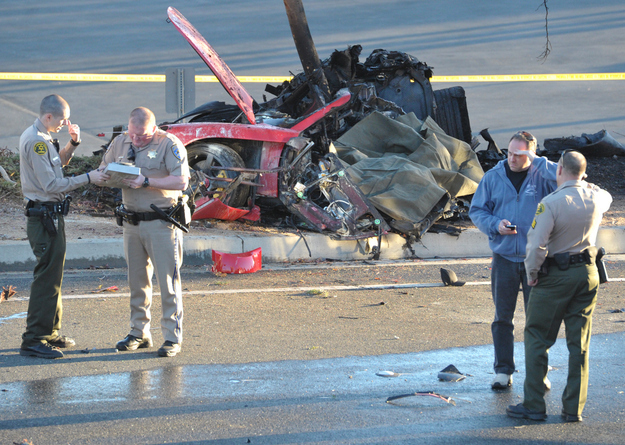 The Fast & Furious star was involved in a deadly crash with a friend; both lives were lost. The friend was driving a Porsche GT when control of the car was lost and it hit a tree in Santa Clarita, north of Los Angeles. Walker was on his way to a charity car show to support the Philippines typhoon relief. 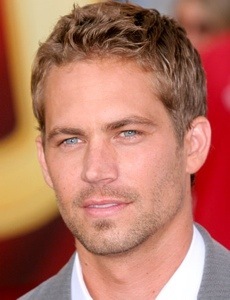 Although the actor was in the passenger seat, the Porsche was Walkers. A close friend confirmed that the actor had just purchased the vehicle and had been taking friends for rides in the car. The car reportedly burst into flames immediately. 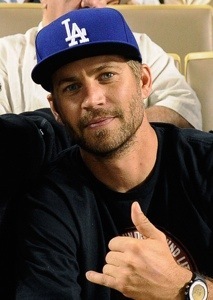 Our condolences go out to his friends, family and the set of Fast 7, as well. Me and a friend were just talking about the actor earlier this week. Although we knew him to be a talented and physically beautiful actor, he also seemed like a nice and sweet guy.